As Creative Director, Jane plays a leading role in Aurora’s artistic direction, working alongside the Principal Conductor and Chief Executive as one-third of the artistic planning team. 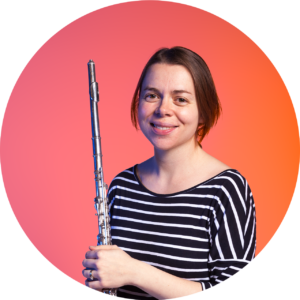 As Principal Flute for Aurora, Jane feels passionately about finding new ways to make orchestral music speak to more people and has been deeply involved in Aurora’s programming, production and devising of work since the orchestra began. Jane was also responsible for launching Aurora’s first projects for young people in schools and now plays a key part in the development of the orchestra’s series for young people, Far Far Away. I tend to judge my Aurora memories on either how many goose bumps or how much laughter they induce. I’m always particularly proud when an Aurora concert induces laughter as I find this quite a rare thing in most orchestral concerts. I think the moment that magician Neil Henry conjured up players from the audience to create Britten’s Fugue from the Young Person’s Guide to the Orchestra was a top one. As was the moment principal pianist John Reid turned on the hoover and began hovering the stage (intentionally!) in our House project. For me though my most goose bump moment is definitely staring up at the snow falling from the ceiling of Shoreditch Church at the end of Zender’s arrangement of Winterreise.